"What do you get when you pair an Alberta bride with a B.C. wedding location? Lots of long distance coordinating!".. Martine & Brett share a private moment on the main dock at Harrison Hot Springs, B.C. 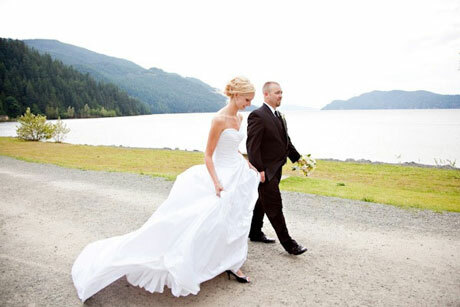 Martine planned her wedding, which was to be held in the Fraser Valley region of British Columbia, while living in Grande Prairie Alberta. With lots of imagination, personal work and much assistance from her coordinator, Kyla Charney, of Happily Wedded After, Martine was able to achieve the wedding of her dreams..
After some alterations and some extras, like a petticoat purchased on ebay, Martine ended up spending a cool $400 on her beautiful gown. Chic and savvy! Martine's flowers were made by Flowers by Gloria in Aldegrove, BC. Not knowing very much about flowers, Martine showed the florist a picture of what she wanted and let het take care of the rest. The result, simple and classic, just like the bride ordered! Not all the bridesmaids were present for dress fittings, so Martine found dresses that had some stretch to them to accommodate for any sizing issues. 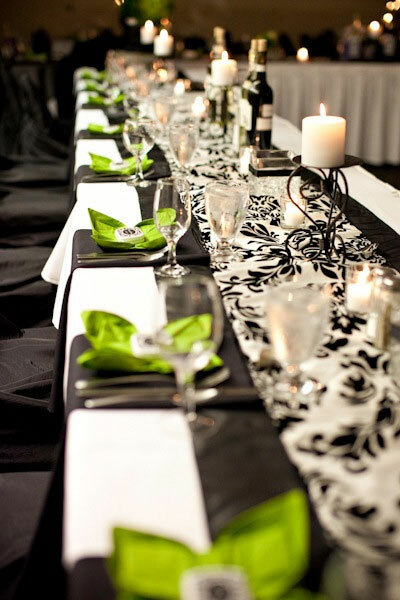 Martine was aiming for a damask theme (black & white) with green accents. 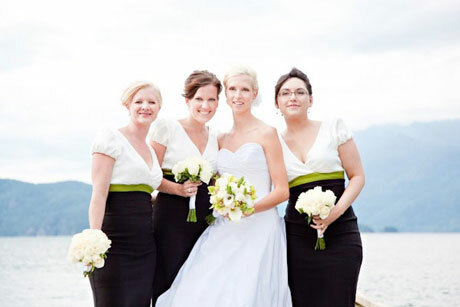 After having narrowed down the perfect shade of green to compliment the damask pattern, Martine incorporated the theme perfectly throughout the entire wedding (including those perfect bridesmaids dresses, above!) 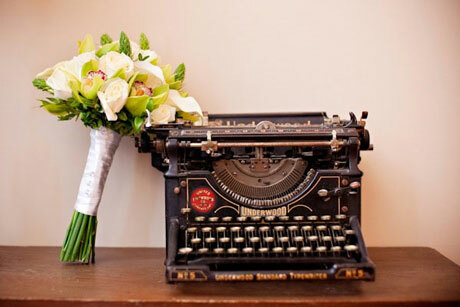 from the décor to the flowers and the favours. Personalized favour tins containing mints for the adults and "smarties" for the youngsters. "I bought green napkins from Ikea. We found a pattern in an old napkin-folding book my mom has had for years. We prefolded them all in the week before the wedding, so they just had to be laid out on the tables." "At first I looked for a green table cloth, but couldn't find the green I liked. 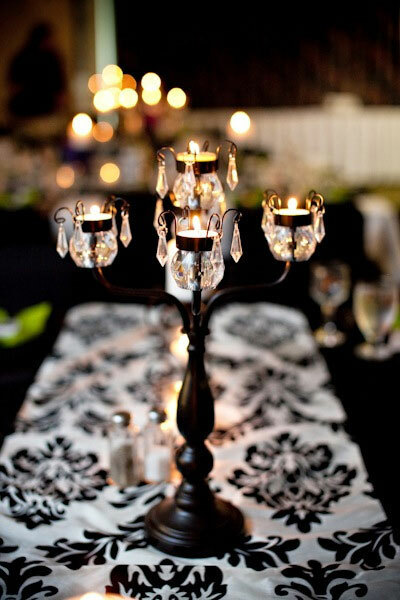 Kyla, my wedding planner, helped come up with the idea of the white table cloth and silky black runners on each side of the damask. I think it looked very sharp!" 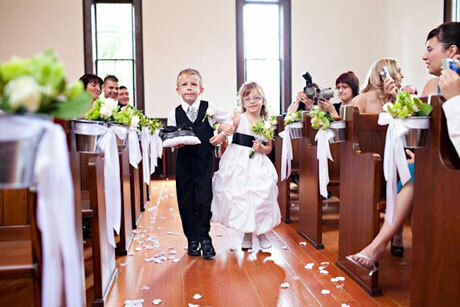 The ring bearer in a Damask tie (another eBay purchase) is accompanied by his flower girl who adds a splash of green to the day's theme with her beautiful flowers. 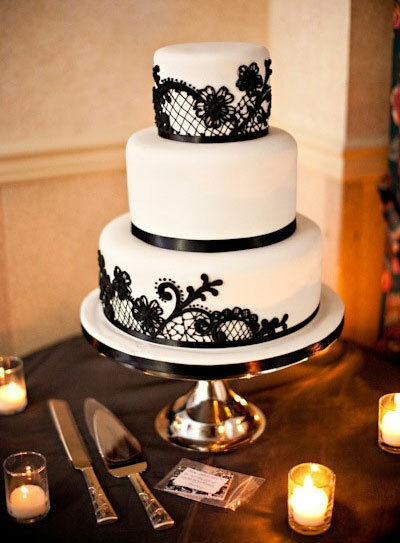 "I wanted a black and white theme, but didn't like the damask themed stencils a lot of cake decorators used. Justine freehanded this design (from a photo I showed her)." Martine is a huge fan of candles and made sure her reception was amply adorned with candlelight. Each table had eleven candles! 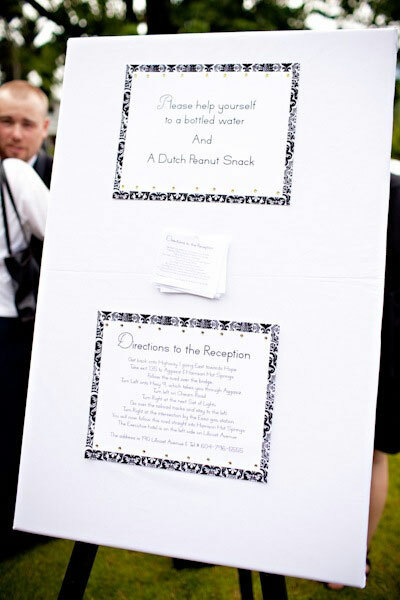 The reception was about a 20 minute drive from the ceremony; so, to make sure all the guests would find the reception location without a problem, Martine had a display board with the directions on it strategically placed at the ceremony. 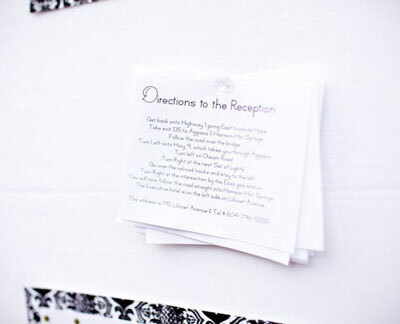 Also on the board were tacked several smaller papers of directions for guests to take along with them. ..and, a smaller version for the road! A road trip no matter how long or short requires some munchies. Martine and Brett made sure their guests had something to snack on while driving to their reception. 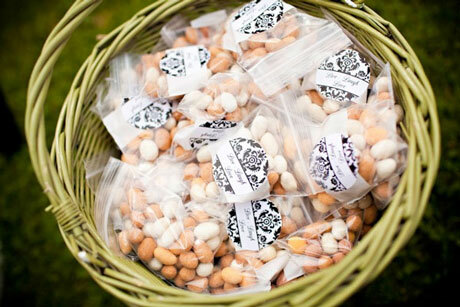 Personalized Dutch crunchy peanuts (called Borrelnootjes - how do you pronounce that??) 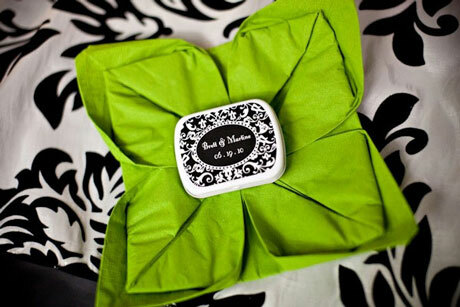 were made available to guests along with personalized (and also green+damask-themed! 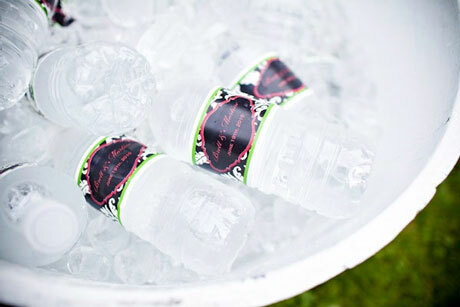 details, details..) bottles of water for the short trip to the reception. 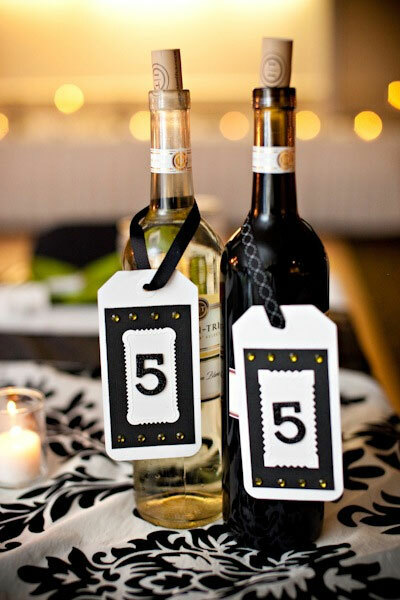 Wanting to make her table numbers a little more interesting than usual, Martine decided to make number signs (in black and white) and hang them from the wine bottles at each table. Martine's Dutch heritage and family history was well represented at the wedding. 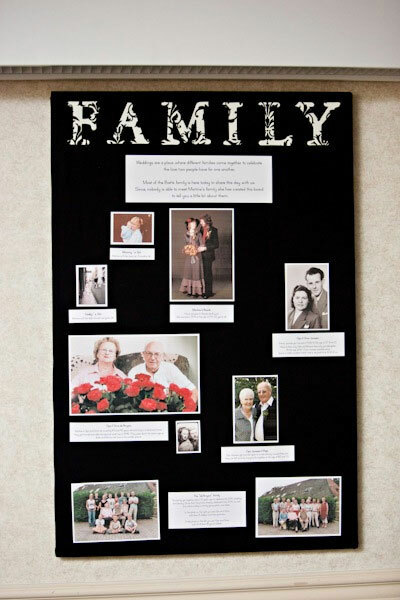 A collage of family photos introduced the Dutch side of the family to the wedding guests while a Dutch dessert table offered sweets enjoyed by the bride as a child. 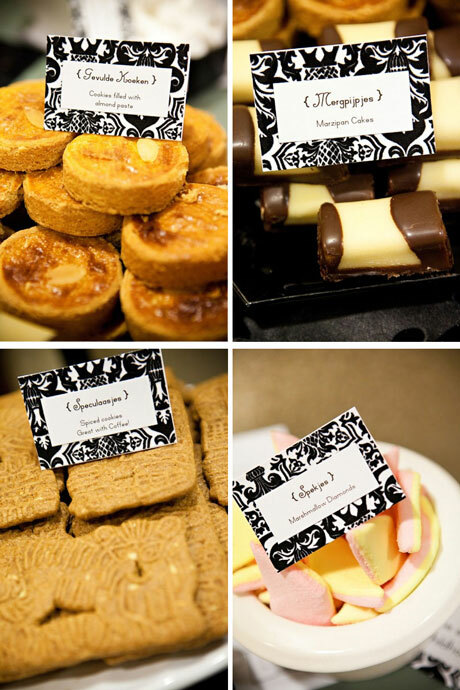 Traditional, Dutch desserts were purchased from local specialty Dutch shops in Chilliwack B.C. Even after adding all these special details to their wedding, Martine and Brett still brought some extras to the day that really added the finishing touch to an already perfect day! 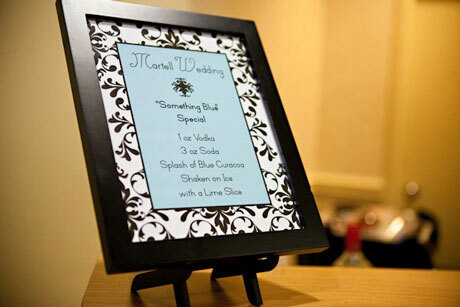 Guests were treated to a signature drink aptly named "Something Blue". 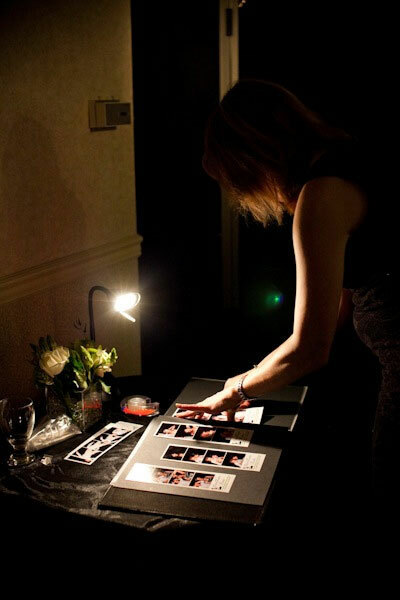 A collage of photos at the reception took guests through a journey of the couple's romance. Finally, a photo booth allowed guests to document the day's festivities. 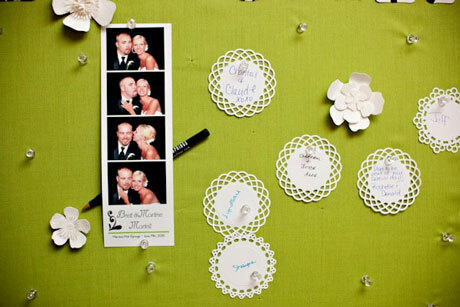 Guests were encouraged to write their name on paper doilies that were later incorporated into the couple's photo booth wedding album. "The photobooth was such an awesome part of our reception. Our guests loved it! Every time they went in two strips would print out.. one for them to keep and one was glued into the album by a photobooth rep. Then they were given a silver pen to write something by it. IF they wanted more copies of a certain picture that was no problem, they would print as many as you liked! I LOVE LOVE LOVE this album." Job well done Martine & Brett! Walking off into the (proverbial) sunset, as husband and wife...Congratulations!